Rich in eighteenth-century charm and naval heritage, Nelson’s Dockyard is a historical marina featuring all the modern amenities, making it the perfect place to undock on an unforgettable Antigua charter vacation. For seven days, enjoy unlimited freedom on the water aboard a spacious catamaran or classic monohull and let Antigua melt all your cares away. Whether you plot your own course or follow our suggested itinerary below, there’s no better way to experience the wondrous appeal of this premier travel destination. Just around the corner from The Moorings base at Nelson's Dockyard is Falmouth Harbour, where you'll drop anchor and spend your first evening at sea in the middle of a secluded horseshoe-shaped bay that is every bit as stunning as it is spacious. With three large marinas and an expansive boat yard lined with eye-catching vessels of all kinds, Falmouth Harbour has become a thriving hub for the yachting community. 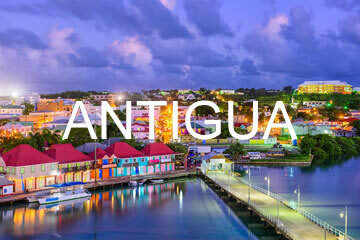 Go ashore to soak up the unique history and culture of Antigua's original British settlement, where you'll also want to enjoy a tempting treat at Sweet T's Ice Cream Parlour. Another premier marina on the island of Antigua, Jolly Harbour offers an array of amenities and onshore activities to visitors of all kinds. From the 18-hole golf course to the stunning white-sand beach encircling the lovely port, Jolly Harbour takes leisure and enjoyment to the next level. Spend the day exploring the land by bicycle or soaking up some rays at the pool then delight your appetite with a seaside dining experience at one of the village's fine restaurants, which includes everything from authentic Greek to classic French cuisine, and of course, serves up some of the freshest seafood dishes you've ever tasted. Often regarded as a "desert island" dream, Great Bird Island captures the true essence of a do not disturb vacation. The snorkeling is remarkable and the views from the hike that leads to the top of the island are unreal. From the most peaceful of settings to the picture perfect scenery, Great Bird Island is an offshore sanctuary for charterers, as well as a natural safehaven for a variety of endangered wildlife species, including red-billed tropic birds and West Indian whistling ducks. Great Bird Island is actually part of the group of small islands known as the North Sound National Park. Adjacent Rabbit Island is home to the exotic brown pelican, and the largest of the group, Long Island, has been the site of a successful Hawksbill sea turtle monitoring project. Sitting pretty on the far north end of Antigua, Dickenson Bay is one of the most popular areas on the island, boasting many top-tier hotels and resorts. The vast sugar-sand beach that extends across the bay offers idyllic conditions for swimming, sunbathing and is lined with laid-back establishments perfect for bar-hopping. Plus, as the hub for Antigua's windsurfing scene, Dickenson Bay is a prime location for all sorts of water sports and activities. Just off the coast of the busy bay, discover a few uninhabited islands that are home to a one-mile long coral reef, which makes for a superb snorkeling site. Uninhabited and unspoiled Green Island is a delightful little hideaway located just off the eastern coast of Antigua. This popular Caribbean snorkeling destination comes with plenty of anchorages, exotic bird sightings, and unrivaled relaxation in the middle of uncrowded serene paradise. Green Island's neighbor to the left - Nonsuch Bay - is worth exploring too with its tranquil waters, pleasant sea breezes, and barrier reef protection. nglish Harbour is a Caribbean sanctuary rich in maritime significance and naval history. The main entrance to the protected harbor features two fortresses standing tall on both sides, transporting you back in time to the 18th century when the Royal Navy's Caribbean fleet was first established there. Not far from Nelson's Dockyard, English Harbor has plenty to offer travelers of all kinds including an array of bars and restaurants, and an English pub that serves up British fare with a Caribbean twist. There is also duty-free shopping, a museum highlighting the local history of the land, and "jump up" steel band sessions that are too fun not to join in. Home to top-rated Galleon Beach, Freeman's Bay is an uncrowded sanctuary and the perfect place to spend your last day of uninterrupted bliss aboard your private yacht. A breathtaking haven lush in tropical foliage and splendid snorkeling conditions, Freeman's Bay is a hidden gem that is just a short distance away from the base at Nelson's Dockyard."